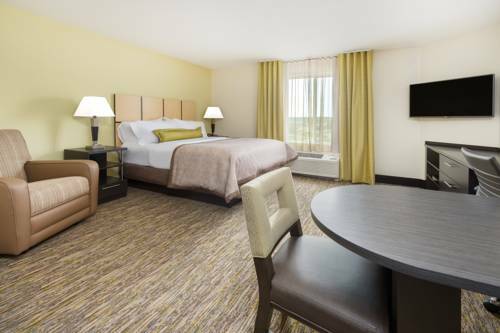 Business and leisure travelers enjoy staying in the Candlewood Suites Extended Stay Hotel Columbia, Missouri. Our hotel is just north of the I 70 & Hwy 63 interchange in Columbia Missouri. We are located just 12 miles north of the Columbia Regional Airport (COU). Candlewood Suites Extended Stay Hotel Columbia, Missouri is located near many area attractions to include the The University of Missouri, Faurot Field Football Stadium, Hearnes Arena, Mizzou Arena, University of Missouri Women & Childrens Hospital, Boone Hospital Center, Ellis Fischel Cancer Center, Downtown District, The Broadway Shops and much more. While lodging in our Columbia Missouri hotel's suites, you can surf the free high-speed Internet access, watch a rental from our lending library on a 42-inch TV, cook meals in a fully equipped kitchen or purchase food at the Candlewood Cupboard. For the best service of extended stay hotels in Columbia Missouri, book your stay at the Candlewood Suites. Don't forget to get out and explore Columbia. A wide variery of entertainment is available throughout our city - great restaurants, night life, live theater and comedy and more. Childrens's program - The ARC is a large indoor aquatic center with exercise facilities. The pool areas consist of a triple loop water slide, lazy river, interactive water play feature and more. Other locations include Chuck E. Cheese, Going Bonkers and The Mud Room. Board Room: Conviently located just off the main lobby the Board Room has a conference table for 10 people with power, and phone connections in the table top, break area, refrigerator, white board and screen, 50" flat screen HD TV and free high speed iternet service. LA Nickell Golf CourseLA Nickell is a public par 70 golf course measuring 6335 yards at the tips. The course has 3 lakes, all in play, and the course is mostly flat with rolling hills. Green fees are never more than $22 with an additional $12 for a cart on 18 holes.